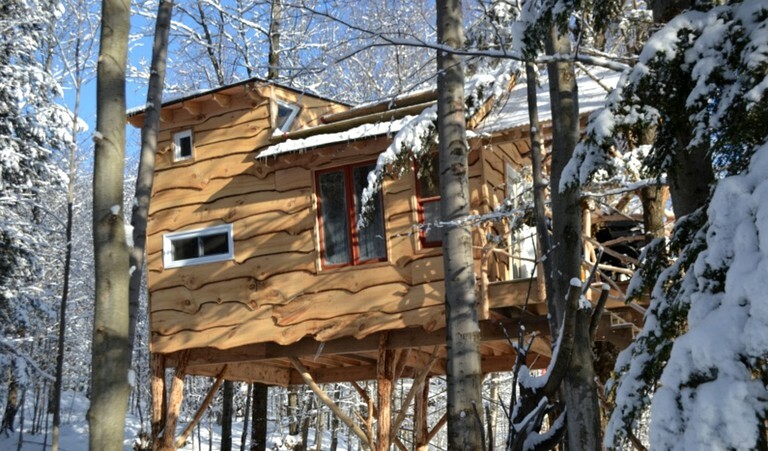 This fantastic, whimsical tree house retreat in Quebec's Eastern Townships is a work of art reminiscent of children's fairy tale books. Slanted windows and crooked walls add to the wonderful character of this rental. 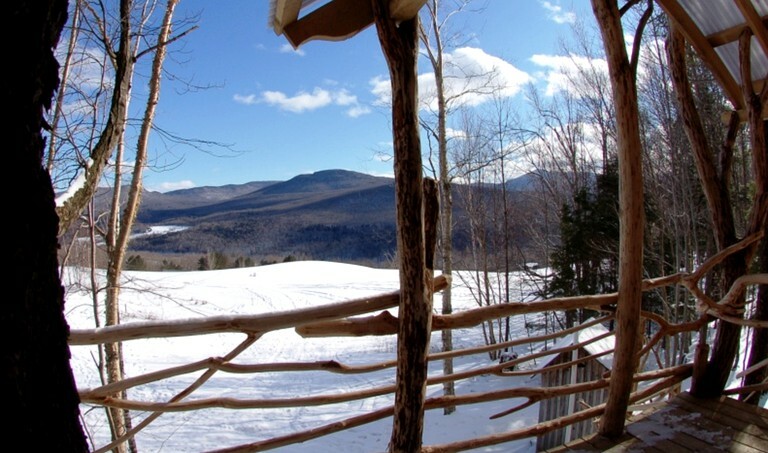 A beautiful, large floor space set high up in a maple tree that´s over 100 years old, with a stunning view down the hillside, perfect for watching the sunrise over the Owl's Head and the stunning view of the Green Mountains in Vermont. 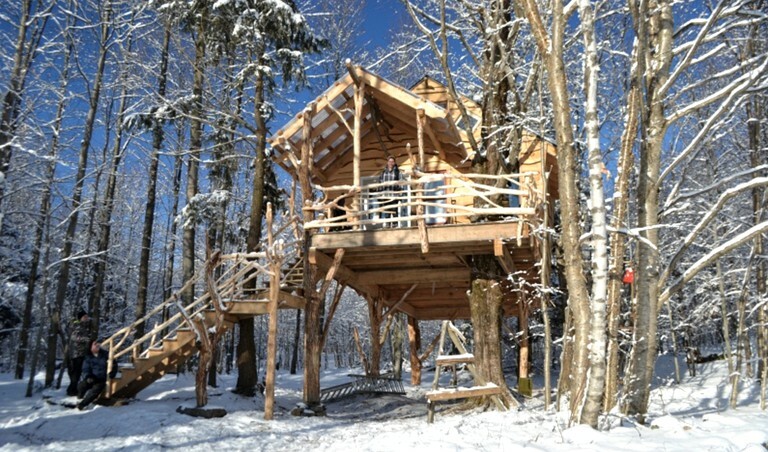 Beautifully crafted from local wood, the tree house is a wonderful spot to share an unforgettable experience with family and friends, boasting ample seating and sleeping space for up to eight guests. 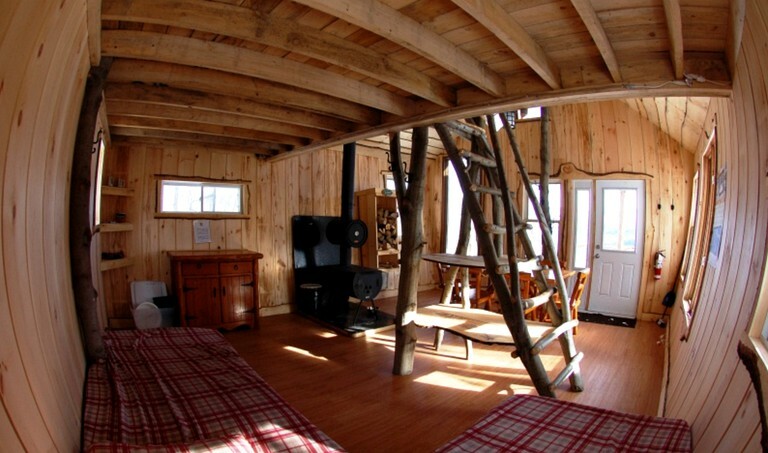 Beds are split between the main living area and a separate mezzanine level that is accessed by a timber ladder. A large dining table space in the accommodation will ensure that guests will all be comfortable and a cupboard and cabinet unit will have ample space for belongings. 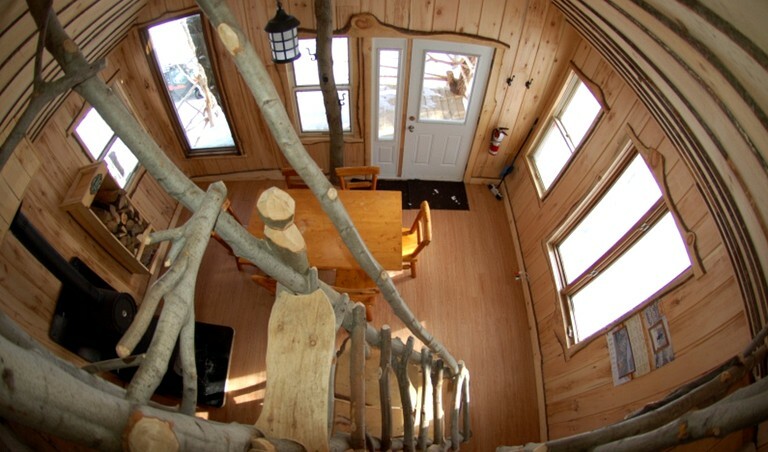 The quirky rental has step access from the outside, leading to a fantastic deck space complete with porch furniture. Sunlight floods into the space through the many large windows, making it wonderfully airy in the summer and nice and toasty warm in the winter around the great wood burning stove, which can also be used for cooking. Glampers should bring their own alternative means of cooking if staying during the summer as it will be too hot to use the wood-burning stove. 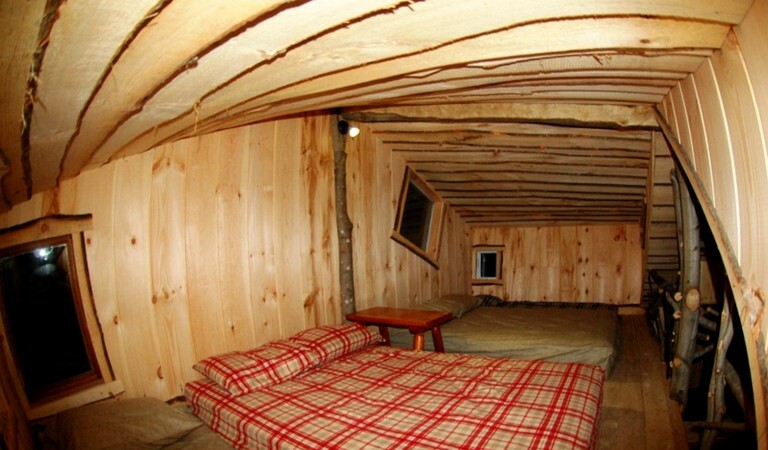 Luxury glamping amenities are provided to ensure guests enjoy comfort and splendor. There’s a central ablution building with toilets, shower facilities, and a sauna for the winter time. 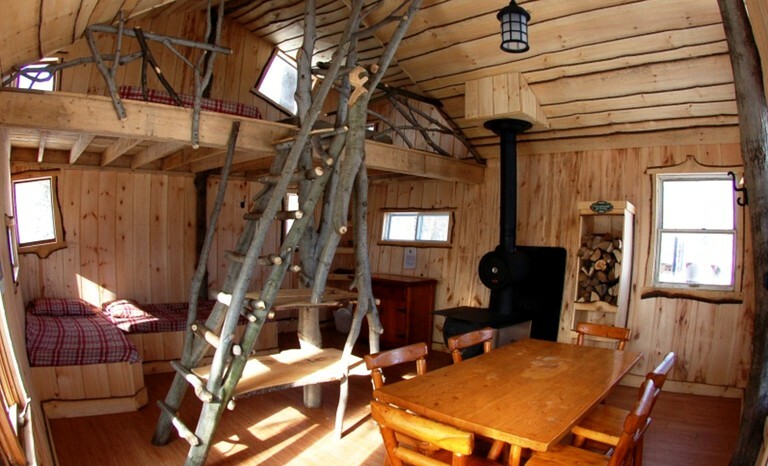 Cooking facilities are available equipped with a wood stove, only used in the winter time. Guests are asked to bring along a propane stove during summer stays. Battery-operated LED lights are provided in the accommodations. Picnic tables fire pits and grills are provided for some family entertainment. Rich in history and cultural heritage, Sutton offers historic trails for glampers to explore. The adventure is endless with exhilarating activities for any outdoor enthusiast. Glampers can enjoy the splendor of the great outdoors with a fishing rod, hiking poles, an off-road bicycle, and ample nature trails to explore. Kayaking under the moonlight, stand up paddle boarding, and river tubing are some of the water sports guests will have at their disposal. The beautiful mountain village of Sutton is also dotted with art galleries, restaurants with creative cuisine, microbreweries, and vineyards, perfect for any experimental foodie. Located away from the hustle and bustle of city life, guests can unwind and relax in quiet paradise along with their furry friends. Guests have access to unique skiing experiences with some of the best glades in Canada. With diversified terrain, the heart of nature, and the authentic atmosphere of the mountains, guests are sure to have memorable moments. Glampers are asked to bring a few items along for their glamping adventure. Sleeping bags or blankets, pillowcases, flashlights or headlamps, towels and paper towels, and all cooking/eating equipment. Dogs are welcome, but guests are asked to bring their dog beds.